there are two excellent reasons to celebrate today, the first is that it is my mom, jessie's, birthday. 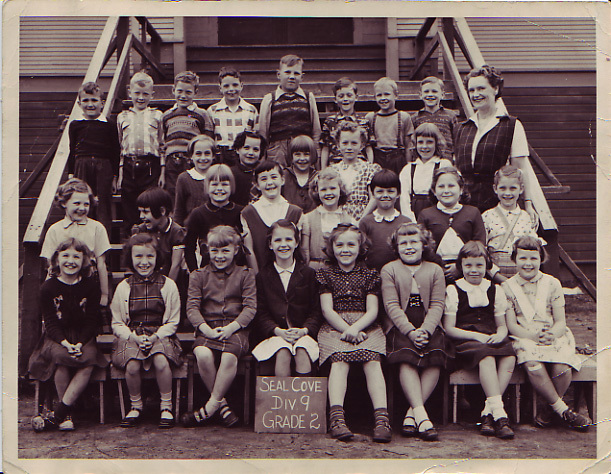 that is her up there in the class picture, she is second row from the bottom third from the left. i love these old class pictures of hers that i have. silvija was quick to point out that there are 8 boys and 21 girls in the photo, those are some good odds for the boys. this picture was taken 54 years ago and she still looks just as cute today. so cheers to you on another birthday, i hope you have a great year! the other reason to celebrate is that today is my second to last day at work or better put, tomorrow is my last day. everyone keeps asking me if i feel excited, but i don't think excited is the word. relieved is closer to the truth, relieved to be taking a little bit off my plate (well a lot actually) and to finally get a chance to sleep in past seven and relax more. things have seemed so hectic lately. as for the spending more time with cohen part, well i guess that would fall under excited, i can't wait! still it will be strange to leave all my co-workers behind and begin my life as a full-time mom, we'll see how it goes. as for things not worth celebrating today (cause the good always comes with bad), cohen has been quite sick since last friday night and as a result i have had very little sleep and am now starting to feel sick myself. we have been pretty lucky so far with him and sickness, but this one has really knocked him off his feet. i joked the other day that it was the first time i think i have ever seen him without energy, and it is true. lying around on the couch all day whining, sipping his juice, and refusing to eat, he is a ball of sadness. tonight he ate dinner for the first time in 5 days, let's hope he is on the mend. Congrats on finishing work - I still have almost three months to go and then I'm still only off for 11 months! Oh well, it'll be better than 6 months last time. It is amazingly hard balancing pregnancy, work, and a toddler isn't it? I'm so exhausted and worn out all the time - hope you get a nice break before the baby arrives. First of all ((((((((((((((((COHEN))))))))))))))))) Hope you're feeling better little buddy. Hope you don't get it T.
Congrats on no more work, I know thats exciting. Happy birthday to your mom.